Before you can take a wade through your favorite streams and rivers, you’ll need to wade through neck-deep piles of fly fishing gear. Chest packs are decidedly one of the most difficult products to select online. That’s why Fly Fishing Atlas brings you our review of the top chest packs for fly fishing. You need something to carry all that essential gear, but how can you know if a particular chest pack is going to get-it-done from nothing more than a picture online? Which style and size of chest pack will get-it-done for you is going to depend on your gear carrying needs and preferences. We love fishing, and we love fishing gear that gets the job done. We want you to find a chest pack that works for you. Most fly anglers start with a fishing vest and eventually find it to be a miserable sweater. Fishing vests have a whole lot of fabric, a whole lot of pockets, carry a whole lot of weight, and retain a whole lot of heat. Summertime fishing in a vest is great if you’re trying to drop water weight. But all the extra pockets get filled with useless little gizmos and boxes that rarely get cracked open. Eventually the fishing vest becomes burdensome, hot, bulky, and cumbersome. Some of us wade deep. In fact, some of us get a few splashes over the waders or even take on a little water on occasion. Admittedly that isn’t always done on purpose either. Wet gear isn’t the end of the world, particularly if it is simple enough to set your things out to dry. But if wet gear can be avoided then obviously that is ideal. After all, we wear waders, buy waterproof fly boxes, and wear rain gear in the rain. Maybe a waterproof sling pack is worth considering. With that in mind, the case against waist packs seems apparent. Its a gear bag, not a tea bag, so waist packs have a significant disadvantage in that sense. Chest packs are the answer to all those problems. You can find a chest pack in every size. Many companies minimize surface contact to make the angler feel much cooler than being wrapped in a traditional fly fishing vest. 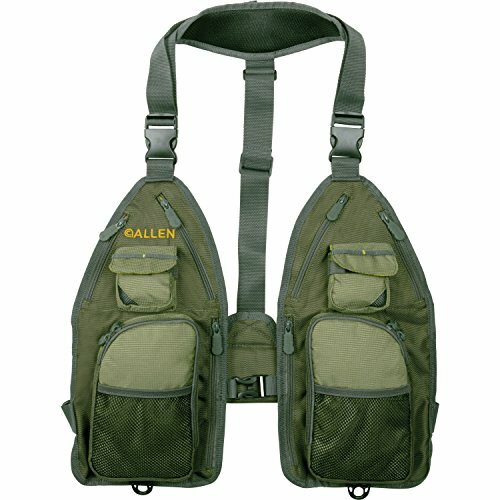 Chest packs are lightweight and can ride high on the angler’s chest for deep-water wading. Good chest packs won’t snag your line or get in the way while casting. In fact, the best chest pack is the one you don’t even notice you are wearing until you need a fly, tippet, or some forceps to release your quarry. 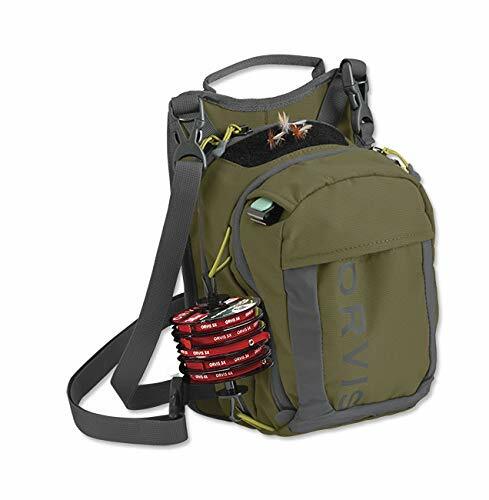 Our top pick for chest packs goes to the Overlook 500 ZS from Umpqua. Umpqua is easily one of the most influential companies in the history of fly fishing. In the early 70’s Umpqua revolutionized the fly fishing world by providing nation-wide access to a huge array of high-quality fly patterns that were only available on a local level previously. The Overlook 500 ZS maintains that high standard of quality that earned Umpqua their reputation all those years ago. The wide shoulder straps are one of the key features of Umpqua’s Overlook 500 ZS. Scrawny support straps on some models become agonizing after a day of carrying the necessary gear around. But the Overlook 500 ZS provides superb comfort and support with a wide shoulder strap to distribute the weight. The waist and shoulder straps feature sizing buckles that allow for ample adjustment with a snag free design. Umpqua also integrated as much mesh as possible into the design of the Overlook 500 ZS to prevent overheating the angler. The contact surfaces of both the front and rear panels, as well as the shoulder straps, are primarily constructed from breathable mesh framed by 420 denier nylon. High wear areas are reinforced with rugged Ballistic Cordura. The impressive storage options Umpqua has incorporated into this chest pack are unequaled. After all, chest packs primarily store gear, so we will cover storage capacity and some details. The internal dimensions measure 5 x 12 x 9 inches, which is broken up into a number of storage compartments. Umpqua lists the Overlook 500 ZS as offering a large main compartment that can hold four large fly boxes. That is going to depend on your fly boxes, but we enjoy the Bozeman Flyworks Waterproof Fly Boxes that measure 6 x 4 x 2 inches. The front pocket is still generous but thinner, and divided up into compartments that are ideal for smaller items like extra leaders, fishing licenses, strike indicators, etc. You can also fit extra spools of tippet as long as you don’t stack them more than four high. The Overlook 500 ZS also sports two internal retractor attachment tabs. The externals of the Overlook 500 ZS boast a couple nipper stations, tool sheaths, a foam fly patch, two stretchy mesh pockets, and D-ring and loops for net attachment points. The back panel has a mesh pocket that can hold a light rain jacket. If your needs change the Overlook 500 ZS can change to suit them. For additional storage, Umpqua designed the 550 cubic inch Mesh Back Compartment that is sold as a combination kit with the Overlook 500 ZS chest pack. 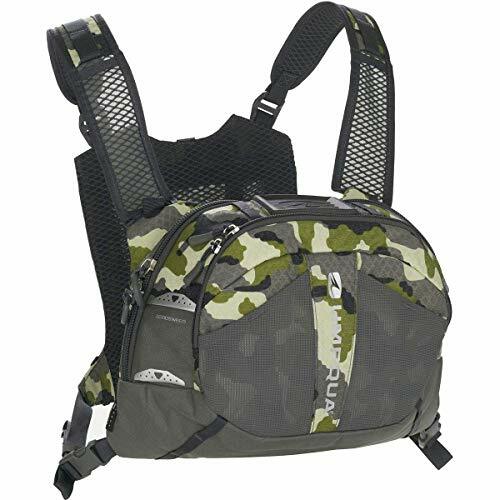 The Mesh Back Compartment is hydration compatible and adds 550 cubic inches (9 liters) of compartment space. But what if you needed even more storage like the storage required for longer hikes or multi-day trips? Umpqua designed the Overlook 500 ZS to integrate with the Surveyor 2000 ZS Backpack which is sold separately. In our experience, that’s a great balance between providing what you need without going overboard. After all, if you need a lightweight, high-speed chest pack, then it shouldn’t pack on the all the pounds we wanted to leave behind in the giant fly vest. And with the popularity of fishing packs and hiking to reach untouched waters, the possibility of integration with a hiking pack is genius. Umpqua recognized that a chest pack can be a tripping hazard if you can’t see your feet. Wading can be tricky as it is without the challenge of a giant blind spot on your chest. The main compartment of the Overlook 500 ZS sports a unique taper to allow for improved visibility while wading. The taper also promotes unobstructed arm movement while casting. Umpqua managed to wisely shape the external dimensions without sacrificing precious internal space. The Umpqua Overlook 500 ZS is available on Amazon.com for a great price here. Our second choice for best chest packs is the Thunderhead Chest Pack. Fishpond gear is synonymous with quality and many of their products are the standard for guides and die-hard anglers. 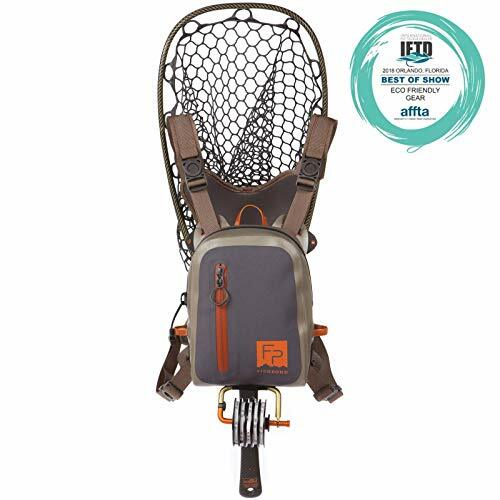 The Fishpond Thunderhead Chest Pack is another rock-solid offering from Fishpond. The Thunderhead Chest Pack is fully waterproof so your gear will only get wet when you want it to. The pack has a watertight design with a strong submersible zipper. You can take on deep wading, surf spray, or heavy rain without getting all your gear soaked. At only 16.8 oz. the pack itself adds very little weight to the shoulders of the angler wearing it. 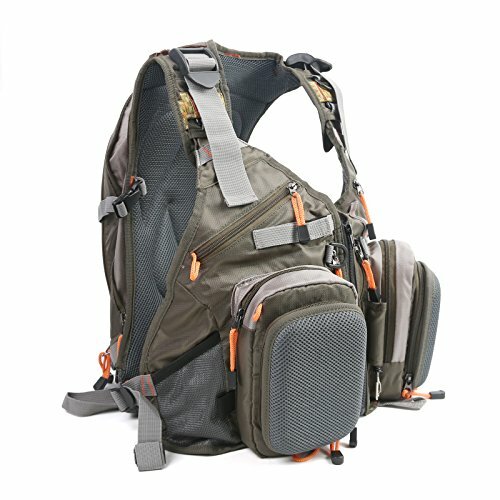 Fishpond also designed a supportive shoulder harness which helps the chest pack have a light feel even while carrying a substantial amount of gear. If you are a serious angler that spends whole days on the water then you know how important comfortable shoulder support is. And maybe you like to hike into remote fisheries. 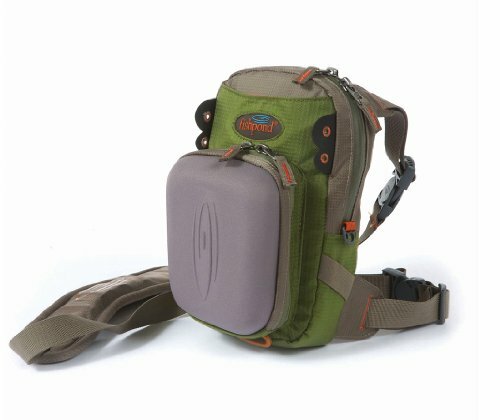 Fishpond considered that and designed the chest pack to integrate with their fishing back packs if an angler wants to carry additional gear. The Thunderhead chest pack has what you need, but isn’t overloaded with useless features either. Chest packs and vests that cover you with thick padding can easily cause overheating. Thankfully Fishpond designed the Thunderhead chest pack as to avoid covering your back with much material. We particularly like the ability to wear the chest pack very snug if needed. Most chest packs are adjustable but cannot be tightened enough to minimize movement. The Thunderhead chest pack allows for almost entirely eliminating movement if needed. The main pocket on the Thunderhead chest pack provides space for everything you need. And has plenty of room for a couple of medium fly boxes depending on dimensions. The main pocket has an internal hanging sleeve that can hold thin accessories like leaders. In addition to the primary pocket, the pack features a stretch mesh pocket with zipper closure on the front of the pack that can fit a small fly box, or accessories like indicators or dry shake. The exterior of the Thunderhead chest pack keeps the distractions and snags to a minimum. The pack features exterior Hypalon tabs for tools and accessory attachment. Fishpond added more tool storage options by incorporation areas for retractors or other tools. The chest pack is a handy patch-on tippet tender and float holder. The lightweight back panel offers an integrated net slot for holding your net whether that be a short or long handled net. But if you prefer a net release, Fishpond included a D-ring to provide for magnetic or clip releases. As is to be expected, the quality of the materials and workmanship is truly premium. 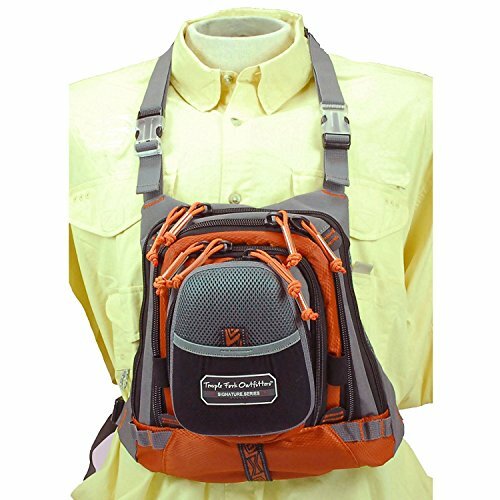 Fishpond uses a 1680D TPU coated recycled nylon to construct the Thunderhead Chest Pack. The Thunderhead Chest Pack keeps your gear out of the water. One of our favorite features of the Waypoints Dual Chest Pack is the modular design. The pack can ride really high on your chest, or the straps can be removed entirely and the pass through webbing allows for attachment to a wading belt or raft frame. However you choose, the waterproof coating keeps your gear from getting hosed. We noticed that the ability to wear the chest pack high on your chest also allows your arms to move freely. Chest packs that ride above the level of your elbows tend to provide for better range of movement. Whether you are casting, working a drift, or retrieving line you rarely would grip your fly rod at chest level. Fishpond shows their knowledge and experience in the practical needs that anglers face on the water. The smart design and reasonable price makes the Thunderhead Chest Pack one of our top choices. Our third spot goes to the TFO 255MCP. Temple Fork Outfitters has a reputation for producing solid fishing tools, at great prices, that truly rivals the feel and performance of very high-end gear. 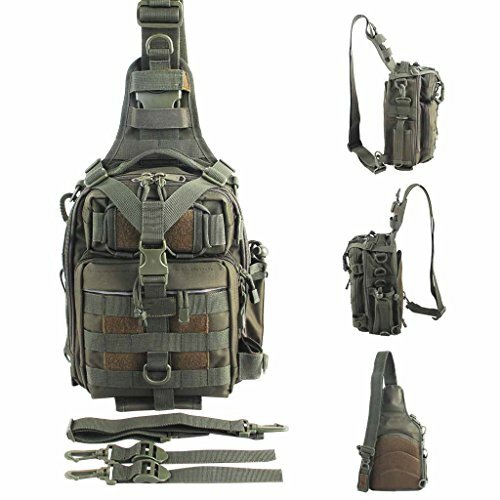 The TFO 255MCP chest pack advances that reputation with a rock-solid pack at a fair price. A chest pack that is ready to rock and roll without all the distractions. With that in mind, TFO designed the 255MCP with a padded neck strap rather than full shoulder straps along with a back panel. The neck strap has a thick pad and is very comfortable since the weight carrying capacity will be less than that of a shoulder supported chest pack. Not all neck straps are the same and accordingly some will be more comfortable than others. When purchasing from the internet it is beneficial to see if you can try on the chest pack or other gear to check the comfort. Understandably, that it not always a possibility. Thankfully the waist and neck strap buckles on the TFO 255MCP provide a good amount of adjustment to help the pack ride comfortably. If you fish in the hot sun then you know lightweight, cool natured materials are key in keeping a full day on the water enjoyable. Sweating profusely has a tendency to cut the day short when water supplies run dry anyhow. The TFO 255MCP keeps body contact to a minimum and has a very cooling effect in hot weather. The back panel features 5 very nice raised vent pads to keep the angler comfortable during summer fishing. TFO discovered a great symmetry between utility and comfort without minimizing the TFO 255MCP any more than necessary. 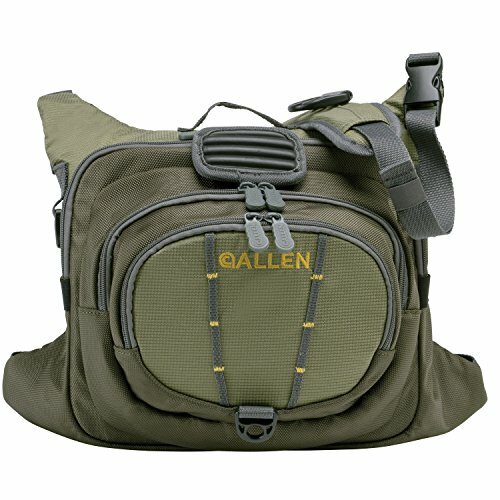 And with no rear panel covering the anglers back the TFO 255MCP is an ideal summertime chest pack. There are 5 primary pockets on the TFO 255MCP. The Main pocket somewhat resembles a 12 inch square that tapers from the bottom up. TFO provides ample storage in this large pocket that can fit multiple fly boxes depending on the size. But its safe to say there should be plenty of room for 2-3 average size fly boxes. The additional 4 primary pockets can also store spare fly boxes if needed. The pockets also feature secondary internal pockets that are perfect for small items like dry shake, extra leaders, and indicators. And the front of the TFO 255MCP features a molded drop down pocket with a removable wavy foam fly patch for quick access to your favorite patterns. The externals of the TFO 255MCP provide generous storage in assorted mesh pockets. The chest pack sports a rugged construction overall. Made with durable water repellent fabrics, corrosion resistant zippers, and all the primary pockets sport big zipper pulls. Of course, there are multiple attachment points, tabs, and loops for accessories. The only feature we wished was available was a D-ring on the back of the neck strap to attach a net. A key part of safe wading is being able to see where you are stepping. A good chest pack needs to stay out of the way while casting as well. That does more than just help you to enjoy yourself–it keeps you safe when you hike a few miles out of the way to your favorite stretch of the river. It gets annoying to have a big and blocky chest pack bouncing off your arm every time you cast. And you can snag your line on the pack if it is in the way all the time. It can really be sub-optimal, to say the least. Also, chest packs that stand out off the chest too much are a real tripping hazard when you’re rock hopping and navigating demanding terrain. Function is important not only to keep you happy, but to keep you safe. The shape of the TFO 255MCP maximizes your range of vision because it’s unique taper doesn’t block your vision on the sides. That is exactly where you will be placing your feet as you walk. That same taper also optimizes range of movement so your casting arm can move about freely without the annoyance of a pack bouncing off your arm. Given the function, comfort, and great price point of the TFO 255MCP we don’t hesitate to recommend it as one of our top rated fishing tools.